By now, you’ve probably started hearing more and more about ACANA Dog Food. So, what’s all the fuss really about? 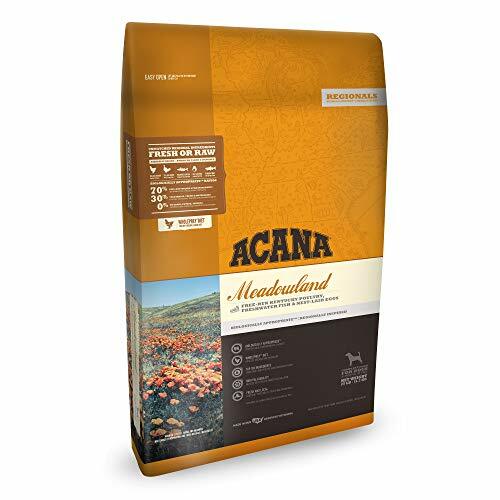 In our ACANA puppy food reviews and ACANA dog food reviews, we’ll look at the who the food is made by, what it contains, and a little bit about how it’s prepared.We’ll also highlight the different brands of ACANA food available so as to hopefully save you time when you’re shopping. 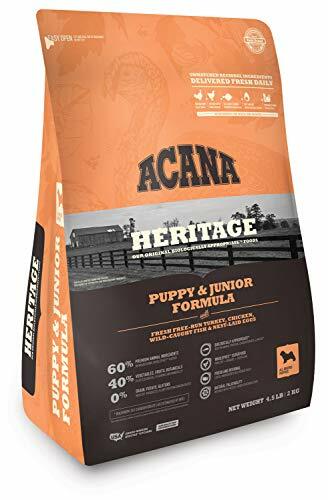 Why the ACANA Puppy Food Reviews and ACANA Dog Food Reviews? 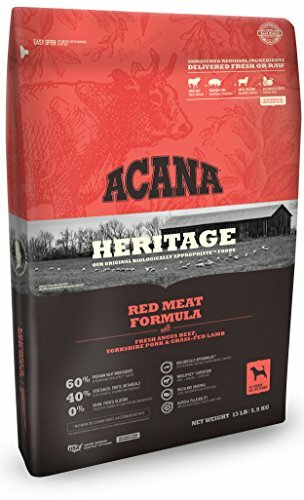 What does ‘freeze-dried’ mean in your ACANA dog food reviews? Isn’t chicken broth full of salt? Why is it in dog food? ACANA is a play on letters — that is, ACANA stands for Alberta, Canada. It’s where a lot of the brand’s ingredients come from, and it’s also where some of the Champion Pet Food-owned company has their kitchens. You may already know that Champion also creates Orijen dog foods, but did you know they have been around for almost 45 years? ACANA makes a huge selection of healthy cat, dog, and puppy foods, as well as dog treats that feature up to 95% real meat. They use what they refer to as Whole Prey Ratios when creating their kibbles, which means that their formulas aim to mimic a naturally evolved canine diet. Where it might be possible to use supplements, ACANA will always use natural, animal-, fruit-, or veggie-based solutions for the same effect. There are many special things about ACANA! One thing the brand may be best known for is using hugely healthy ingredients. All veggies, fruits, and livestock used for ACANA foods come from regional sources and, as far as we can tell, they are from small or known, trusted suppliers. That’s a lot more than we can say about most brands, to be fair! ACANA’s also known for producing incredibly meat-focused recipes which include between 60 and 70% animal protein. Expect to see things like wild-caught flounder, nest-laid eggs, and grass-fed lamb on the ingredients lists here, as well as nutrient-rich organs like liver. And where a lot of low-cost brands might use grain or corn fillers to bulk up their foods, ACANA only uses wholesome non-GMO veggies like pumpkin and peas. 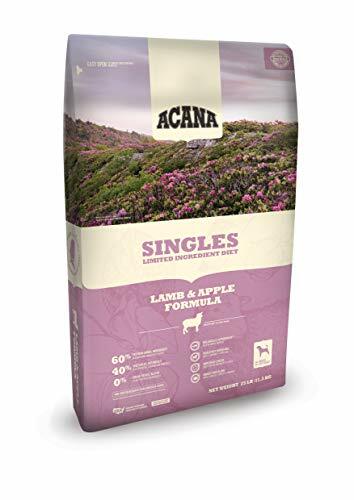 ACANA Singles – Here’s where you’ll find ACANA’s limited ingredient formulas, and each contains only one type of animal ingredient. There are six types, in six different flavors: pork, turkey, duck, lamb, beef, and mackerel. Sadly, there aren’t any wet foods for those pups who love a good loaf or pate. As is the case with Orijen, ACANA as a brand is not keen on outsourcing. Because it doesn’t own any of its own canning facilities, therefore, it is not creating any canned foods at all. 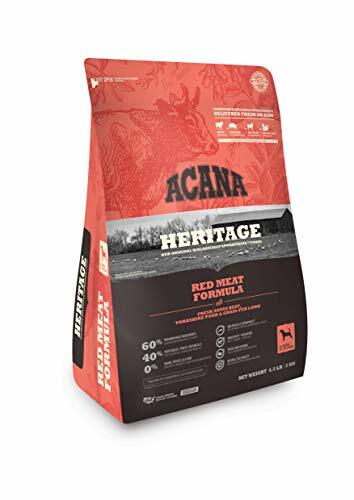 To the very best of our knowledge, there aren’t any ACANA dog food recalls at the time of reviewing. So, there aren’t any voluntary or FDA recalls at all to mention here. We can find no evidence of ACANA dog food recalls to date. How about a closer look at those appetizing dog foods then? This grain- and potato-free recipe is made with juicy pork, ranch beef, and succulent lamb that’s been grass-fed. That’s a great start to any dog food ingredients list, we reckon! Contains lovely glucosamine that will aid in protecting your dog’s joints. None! We’re hugely happy to see such healthy ingredients and a balanced, protein-rich nutrient profile. Easy to digest and full of nommy proteins, this fish and poultry recipe is designed for all canine life stages. And, because it’s formulated for all breeds, too, your little Shih Tzu, Peke, or Daschund can enjoy it just as much as your large Collie or giant St Bernard! It gives your growing or grown pooch nice levels of glucosamine and DHA. All-natural, high-quality ingredients can make dog food more expensive than one that uses fillers and cheap ingredients. So, like all the ACANA dog food reviewed in this article, this recipe’s a little pricey. ACANA is pretty big on emphasizing the real meat content in its food. In a 25 pound bag, therefore, you’ll often see stats on how much chicken, fish, or egg is inside. And we like it — in 25 pounds of food, there’s 17.5 pounds of raw or fresh premium meat. We’re not complaining! 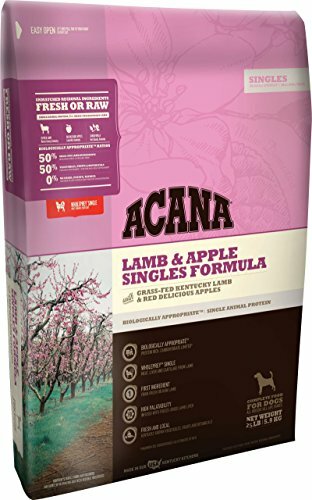 ACANA puppy food is quickly earning a good reputation for itself. This Puppy & Junior blend is the most popular product. 60% of this lovely ‘junior’ recipe is meat and animal ingredients, the rest is from veggies and healthy fruits. The top two ingredients, which your pup will adore, are turkey and chicken! Uses no GMO ingredients at all. Like most other ACANA and Orijen foods, this puppy recipe has a fairly high price point! All the goodness of fish, chicken, eggs, and turkey at 408 kCal per cup. It’s suitable for all breeds of pup and half the fish, egg, and poultry ingredients are totally fresh. Five stars! 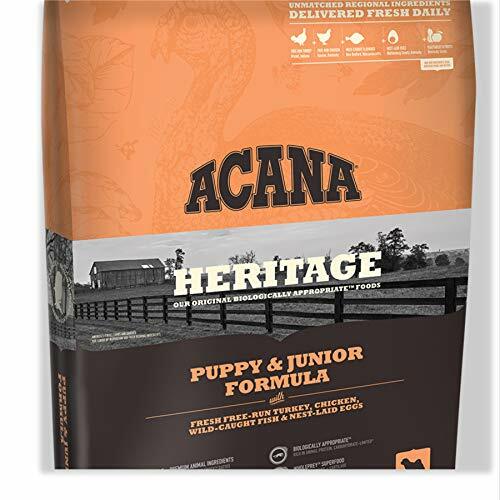 We’ve noticed how interest in ACANA heritage is growing super-quickly, so here in our ACANA Heritage Dog Food Reviews, we weigh up the pros and cons for you. All dog (and puppy!) breeds can dig into this trout, perch, and catfish recipe — it’s an All Life Stages food for doggies large and small. As it’s from the Heritage line, 60% meat is used in this kibble. In this case, that’s from freshwater fish! It has a suitable, if not optimal, calcium-phosphorus content for larger puppies and dogs. It’s hard to find fault with ACANA food in general, and the same applies here. 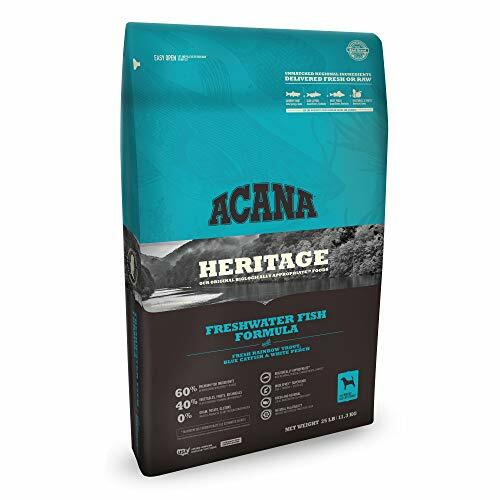 This Heritage Freshwater Fish formula has a LOT of good things going for it, let’s be honest. No artificial or synthetic agents have been used to color or preserve it, and there aren’t any grains at all or fillers. It provides puppies and grown-ups with glucosamine and it’s chicken- and potato-free. There isn’t even egg in here! The Regionals range includes even more fresh and dried prey ingredients than ACANA’s Heritage line. In fact, you’ll find a 70:30 ratio of real, delectable, non-GMO meat to vitamin-packed fruit and veggies. Premium pricing aside, it’s very tough to find a downside to any of ACANA’s foods. This Grasslands Regionals recipe is probably the most popular choice with dog owners. Boasts Omega acids that promote gorgeous coats. 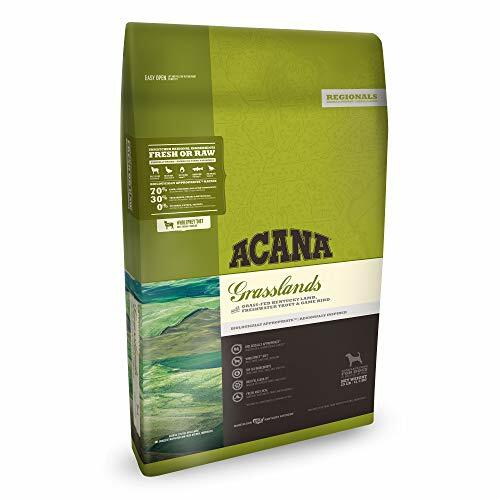 Because all dogs can enjoy this flavorful Grasslands formula, it’s ideal for so many different breeds — Labs, Golden Retrievers, German Shepherds, Boxers, Pit Bulls, and more. You name it, they’ll probably thrive on it. And that includes gluten-free or potato-intolerant pooches. Grass-fed, fresh lamb makes up 60% of this kibble, and it’s the only meat that’s used. So, here’s a mouthwatering limited ingredient recipe for dogs (and pups) who can’t tolerate chicken. Contains zinc, a critical nutrient for great skin. None, really. Even if lamb’s the one thing your pup can’t tolerate, there are five different single-meat recipes in this range! We just adore reviewing great dog food, and this is one great example. Especially because a lot of hypoallergenic formulas offer just the nutrient basics and nothing more — that’s not the case in this recipe, which offers glucosamine and Omega acids. And it’s for all breeds and ages, too…nicely done! ACANA does make a big point about how some ingredients are freeze-dried, so it’s natural to wonder why that’s so exciting. In a few words, the ingredient in question is frozen, then the ice is removed from the product. This keeps the food itself very close to perfect in terms of its quality and shape, and at the same time, it locks in the nutrients that our best friends need most. Freeze drying is also one of the more expensive ways to preserve meat ingredients, as it requires specialized technology. This is part of the reasons why ACANA dog food is considered very high-quality, and typically priced at a premium. That’s not a common question, but it is a very clever one! Technically, ‘broth’ in dog food is just liquid in which animal ingredients have been boiled. Those can be bones or meat, but the broth itself isn’t what we’d usually find on the supermarket shelves. So when you see ‘broth’ in a dog food, that doesn’t necessarily mean it’s going to be full of salt. What it means primarily for our fluffy friends is some extra flavor in their food, and it can also provide a small dose of nutrients, too.